When I used to work in the city, my office location was not in the best area of town. Frequently, there were questionable people walking around. At the time, there had been an increase of violent crimes and some vehicles had been carjacked in the area. Needless to say, I did not want to be the next victim. As an added safety measure I walked with a group out to my car and always had my keys ready. I was lucky to never be a victim of of such heinous crimes, but I was always on the lookout. Little did I know criminals use multiple ploys to get their victims out of the car. I believe there are ways to prepare for this type of personal crises and it all starts with good old-fashioned common sense and avoidance. In a SHTF scenario, many urbanites who are bugging out of the city could easily find themselves in a carjacking situation. In times of crisis, you have to face the fact that people will kill you, if necessary, for what you have, and do anything they can to get you out of your car – even trick you. In a bug out scenario, you will have valuables, computer gear, survival items – these could all be worth taking a life for. They will choose their life over yours’, so keep that in mind. In desperate times, you have to assume the worse and make every priority to keep your family safe. Situational awareness is the number one way to avoid being carjacked. Determine where you would go if you had to seek immediate cover from an explosion or gunshots. Understanding where the most likely places for this type of crime are can help you avoid and prepare for the likelihood of what you may come face to face with. For instance, did you know that two out of three vehicles are carjacked at night? Pay extra attention to your surroundings when it’s dark; especially in the more likely carjacking strike locations: gas stations, ATM machines, parking lots and shopping centers. As well, keep these other areas in mind. Areas that could easily hide a group of criminals so they blitz you all at once. Carjacking Tricks that Criminals Use. Don’t Fall for These! Bump and Rob – One of the most common tricks these criminals use a technique called the bump and rob. Criminals will intentionally bump into your car as a tactic to get you out of your car. What to Do: Instead of getting out of your car, take notice of their license plate number, type it into your cell phone or quickly write it down on a piece of paper and drive to the nearest police station. Do not get out of your car if you suspect ill will is at play. If you are bumped from behind or if someone tries to alert you to a problem with your vehicle, pull over only when you reach a safe public place. Good Samaritan—The attacker(s) stage what appears to be an accident. They may simulate an injury. The victim stops to assist, and the vehicle is taken. Think before stopping to assist in an accident. What to Do: It may be safer to call and report the location, number of cars involved, and any injuries you observed. The Ruse—The vehicle behind the victim flashes its lights or the driver waves to get the victim’s attention. The attacker tries to indicate that there is a problem with the victim’s car. The victim pulls over and the vehicle is taken. What to Do: Do not get out of your car. Call and report the incident to the authorities. The Trap—Carjackers use surveillance to follow the victim home. When the victim pulls into his or her driveway waiting for the gate to open, the attacker pulls up behind and blocks the victim’s car. What to Do: If you are driving into a gated community, call ahead to have the gate opened. Otherwise wait on the street until the gate is open before turning in and possibly getting trapped. Another common trick that could be used is if you are alone on the highway and come across a car blocking the highway or have cones up in order for you to slow down, someone may be trying to carjack your car. Ever had a promotional paper placed under your windshield? Don’t get out of your car to remove it. It’s another trick being used. Read more here. 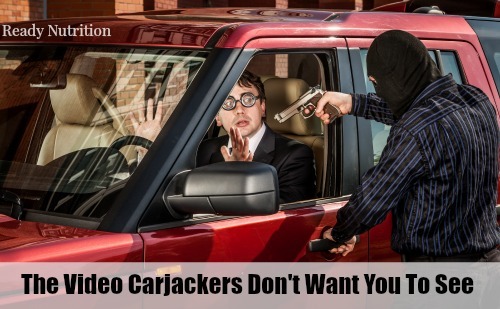 In the following video, more tactics that carjackers use trick drivers is discussed. A police officer goes on to discuss how you can get out of that particular situation. He emphasizes that the key to survival is to always stay mobile. Keep that in mind when watching the video. Keeping your door locked at all times and make every effort to keep your window up, especially when stuck in stop and go traffic. Leave space between your car and the car in front of you when stopped so you have room to escape if someone tries to carjack your car. A good rule of thumb is if you can look over the hood of your car you can see the wheels of the car in front of you touch the pavement, then you have room to go around. Choose well-lit areas to park your vehicle and avoid remote parking areas. When you are returning to your car, always have your keys in hand when you approach so you are not fumbling around your car door. Having mace or pepper spray in hand would also be advantageous. If you feel that you are trapped, trust your instincts and escape from the situation. Mobility is key. If your car is stopped and can’t move, crooks will see an opportunity to get you out of the car. Do not try and talk to the criminals. That includes arguing or fighting with them. Leave the situation immediately. Much of this information is good common sense, but there are times when unavoidable situations arise and it’s paramount to be ready for them. Avoidance is the easiest solution to preventing a carjackings. That said, if you find yourself in a questionable area of town, make sure you are aware of the situation you are going into. No reason for us to drive at night ( but some have to work shift work), if I can’t get something done early in the day, it’s not worth doing. We dine out for lunch several times a week. Shop early in the day and never run at night. An emergency would be only reason to. Sometimes in a large shopping center (it has happened to me several times) young people will ask for $20. to get to point B (ran out of gas- BS I say). I keep on walking, or if person acts aggressive, I go back in the store and report harassment in parking lot and to call police am afraid to get in car until person is away since they could pull a gun, knife, etc. All the other info posted is something the average person doesn’t know- many would fall for the phony injury act, etc.. will pass this on to others. Situational awareness is the key. You also need to mentally play the game all the time. Pretend you are Inspector Clueseou form the Pink Panther and Kato is going to attack. Always observe your surroundings, try to anticipate where or how someone could attack. look in the car before you get in, walk with your car key ready in your hand, do not fumble with your keys and a shopping bag and a purse at your door in the dark. Also,have a mental line drawn as to exactly what you will tolerate before you act. Most people wait to long when they already felt defensive instincts tell them to act. Have your level of threat and response pre thought. Such as if someone steps to close to make you feel threatened, you will demand they get out of your space, or you will defend yourself. Note on dealing with the “bump and rob” ploy: If you are bumped from behind, you may not be able to get a plate number. At least half of the states do not require front plates. Some people put a “vanity” plate where the front plate would otherwise be, but thugs would obviously avoid such an obvious identifier. man, get a decent narrrator. This guy is wretched. Ruins the whole thing. Find someone with a decent command of the english tongue. Where is the mention of being armed? if you are in a state where you can get a gun licence then do so. I live in Florida and carry when I’m on the road but seldom carry in a store but my pistol is in the car ready to use.I also have a stun gun in the car and many weapons around the house for protection in case of breakin. You have to be able to defend yourself at all times. We should at least be well armed as a Secret Service agent on a presidential security detail. Why do we need to learn this? Should we not simply teach people not to rob? This goes on even in small towns. I am in a med. size city. Crime is everywhere, grow up.